There's a new Windows client beta available for preview. Please check out v6.15 Beta II, available here . Ooookay... Installed as normal and what in the name of the purple pussycat did you do to my note titles??? They're normally in the same font and weight as the dates and other details, but now they're scratching at my eyeballs... Guys - I think you should expect comments about this. Ugh. I'll try out more of the app tomorrow. Any more Easter eggs hidden around? Edit: disregard the notebook showing as 'templates' - that's one I created where I keep my, er, templates... so I won't delete or lose them. I know on the Mac beta the templates feature will be turned on in full hopefully soon. Looking forward to testing it for sure. The new template feature would be more useful if it included a way to automatically add the current date to the text via template, kinda the way we can do with MsWord. It would also be nice to be able to get to it via keyboard, currently it seems to be accesible via mouse only. I don't mind the bold title font, but I would suggest that each time a change to the appearance is added, the option to hide it should be included, somewhere in options. On the plus side, it sees that the invisible rule line in connection with bulleted-numbered lists appears fixed. Thanks. Any more details; did the note get saved to a template list? How are they indentified? I'm currently using a script (Mac) to retrieve a template from my collection. I'm using a template tag for identification. I'm liking this template feature... I've got quite a list of "template" notes already that are simply tagged as templates.. this new feature could be quite useful! On a negative note... I've still got hundreds of invisible tags in my tags view.. rapidly approaching the "6-month" anniversary of when the bug was reported. Thanks for this. I've been watching for the Templates option since it was pre-announced to Evernote Community Leaders. I really like this feature but with one or two small things that could improve it. I had to save each of my existing 'templates' using 'Save as Template' for them to appear in the template 'browser. That wasn't a major issue but I needed to realise that this is necessary. Might be worthwhile highlighting when the function comes out of beta. I then discovered that one of my templates needed a couple of minor-amendments. I tried editing the original template note but that didn't change the template that was saved as a template. I then could not edit the saved template in the new function. It seems I had to delete the template and re-save the revised one. Perhaps some means of editing a template would be useful. In snippet view (and possibly others), titles are now boldface. They stand out, for sure, but it seems a little much. It'b be nice to have control over the title style. In the Notebook view, notebooks whose names with '@' (and possibly other special characters) sort below notebooks whose titles begin with alphabetic characters. So for example, '@Todo' sorts after 'Templates'. This is different than the notebook list in the left panel, where the sorting is the opposite: '@Todo' sorts before 'Templates' I use this as a cheap way to bring a couple of important notebooks to the top of my notebook list. Found these guys complaining about the bold titles in another thread - so far it seems pretty unanimous that we hate it. Wondered if my main lappy HD screen was causing an issue, so came here to my 1368 x 768 'backup' laptop. And this is on 6.15.2. Yep - I still hate it. created a new note from the template and noted that 'save as a template' is greyed out. Made some changes, and it comes back. Couldn't seem to save that as a new template though; maybe my fault. Another new note, another new template. Saved the note back to my own 'templates' notebook. Made some changes and saved an updated template. Saves as another template with the same name as the original (?) but it's easy to delete the original. Evernote glitching (freezing) during the process though - it's a bit slow when editing templates. I am on the beta channel and received the V6.15 today. From the release notes (see below) it looked like a production release and not a beta (2 or otherwise). Is today's release V6.25 beta or not? Yup - still beta. ? I run snippet view and quite enjoy seeing the note titles bold... actually, when I first loaded this beta, it just seemed 'normal"... going to my 6.14.5 build it's like something is 'missing'. @ej8899 I have to admin that bold titles look natural in snippet view. Sady, I generally use list view and bold title are jarring I hope EN makes bold titles an user option. Hmmn. I think this coder must have been a Snippet user. I agree - there, it's quite useful and a natural 'break' from one note to another. On any list view though, it is serious overkill. Options then...? Have been trying to annoy Evernote's spell check, but 6.15.2 doesn't seem to have a spell check that I can find. Some words are red-underlined, but when I add my tech terms to the dictionary, the USER.DIC file in my Evernote folder remains stubbornly empty. I added some terms to it myself and restarted Evernote - the same words are still marked with red... ? Spell check is working for me. Custom Dictionary.txt updates when I add my terms. Sadly, you no longer ﻿can edit words into the text file. Some goofball of a programmer added a checksum_v1 to the file. Wonderful. MD5 checksum so you can hack it. Hideous Horrendous Bold titles need to go. Not only are they ugly but they appear blurred as compared to the regular text, to me anyway (side list). Wanted to be sure my opinion was clear. ? I assume that I will have to re-add all the words to my dictionary? One's I have added recently are squiggled again. Template note does not keep the title. I have a template wherein the title is always Phone Log - . Easier to keep using the double click desktop method at this point, though this template method would be better if title were preserved. The bold title makes me think I am looking at unread emails. Yuck. The highlighter in the left panel is still the same color as the note counts. Very big plus, can now drag text between notes in separate windows. Yeah! Bold titles in the Snippet View makes sense, but not in List View. I agreed that it feels like viewing unread emails. How do you delete a template? Hover over the template 'card' - there is 3 dots showing on the top right... click and then delete. Hey, Evernote devs... we need a 'shortcut' that we can add to the toolbar to get to this template page quickly! Well, the default title of new notes in EN is still the top line of note text, I find that still works even with templates, is that what you mean? F2 or clicking on the title, the title just appears. I am not exactly sure how long it has been this way, but the background color for the light setting in the left panel is now light grey, instead of white. Didn't notice because I usually keep the dark setting. It would be nice to have that light grey background color available for the entire screen as an option. A couple of releases back, 6.14 GA for sure. Yeah, doesn’t help in my use case. Thanks. Several people have already posted on the BOLD font in list view. Thank you to @gazumped for pointing out where I need to post my comments. My EN practice is to include pertinent info in my Notes title so I can pick up as much information when glancing my list. Besides the BOLD font being visually distracting, the font width requires greater space. I'm either going to have to widen the Title column or widen the EN Window on the desktop. Both requires surrendering precious real estate on my screen. BOLD font needs to be a selectable option. While we are on the subject of fonts and views, I'm not sure when this came in but the light gray date font on the white background used in snippet view is very difficult to read. Other than title, date is the next thing that I'm looking at when scanning notes in the snippet pane. It does make it harder to pick out the note that I'm looking for. List view uses the same black font for all fields so I don't see why snippet view was selected for this special treatment. I'm thinking the idea is to not delete the original note. Anyone know if these templates are getting sync'd across devices? I'd like to guess that it will - I just haven't tested yet. But yet, a bonus feature could be to allow each template to sync (default setting) or stay local only. Cannot add a blank line in one note. This note was created on the PC and modified on the iPhone. Some of the lines are now single spaced and cannot add a blank line on the PC. Saved the note before I fixed it with some copy paste magic. ENEX available if you like. Is it just me or has the copy highlight color changed from gray to light blue with this beta? I like it IAC. The screen started flickering when I cut an image from a note and attempted to paste it back into the same note in a different location. I have also noticed that it hangs up when doing a sync and then trying to view the contents of different note. 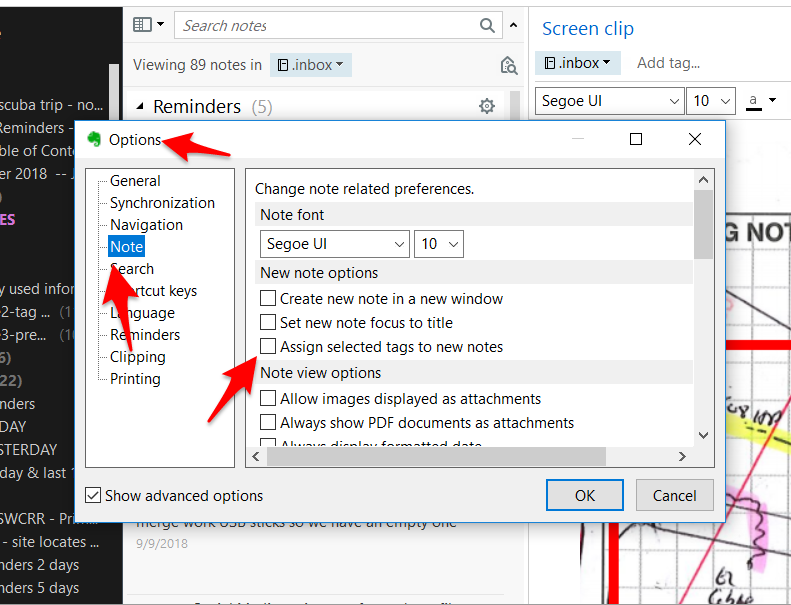 I cannot view the PDF if I open it as an individual note in a separate window. Do you guys face this problem? Same deal for me, my PDF disappears. Appreciate bold titles in snippet view, great enhancement for better readability. So, it is not just me. Cannot believe such obvious bug was not tested. What quality control/test plan the development team has? Or am I expecting too much? 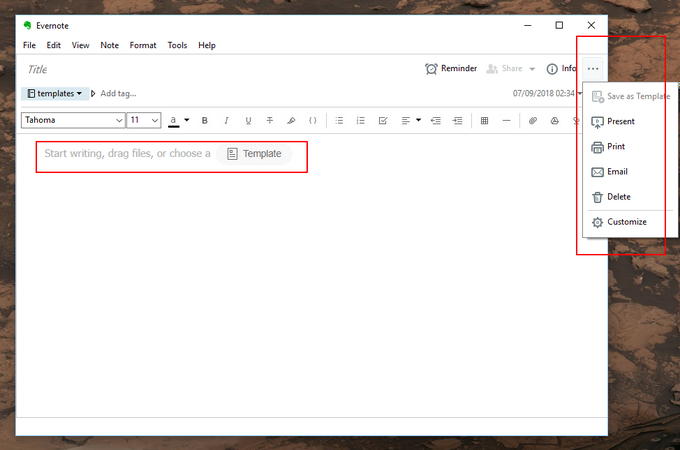 Edit in a standalone window and close the note directly, edited content wouldn't be saved. PDF viewer is broken. Can't see anything but only a line. However, the new template feature and bold title really surprise me. This makes me feel EN is walking back on the right track. I also don't like bolded note titles in my list of notes. However, I think bolded titles in snippet view should be standard. Is it just my system doing this or is it normal behaviour. I have notes where there is a label (eg: Tahoma/10pt/bold/blue) and the next line should be the data (Tahoma/12pt/normal) indented. This requires that line 2 of my "template" note always have that space to show what formatting EN is to use on that line. Because EN does not allow a font/format selection unless there is some character to apply the font/format to (ie: you can't have a blank line where Tahoma will replace the previous line's Arial,) a space character (or something, anything) must be on every line that requires a format change from the previous line. If it's visible it must be replaced but spaces are nicely invisible. The new template feature is wonderful except that every time one of my placeholder spaces is encountered, a "&nbsp" is printed in the note body. Not just a non-breaking space, but the characters "&", "n", "b", "s", and "p." All over the place. So, to use my template I have to then replace all these 5-character sequences with my data rather than just leave the space character and type my data. Double-clicking highlights only the "nbsp," not the "&." This replacement also sometimes removes my formatting and the label format is then applied to the data. If I don't review every note carefully, I end up with "&nbsp" in places where there should be nothing but empty space and oftentimes, data that looks like the preceding label. A really ugly mess. This extra vetting of each note means I can't, unfortunately, make use of the template feature and will just have to continue to muddle through with a "Template" notebook and copy/paste as other have been doing. The copy/paste is much, much, much faster than create from template as it is now. It was a great idea, something that OneNote has had for eons although they took it a step further and allowed a template to be a default for new notes, but EN's implementation won't work in my situation. ... or is it just my system acting up? Someone mentioned we can now drag text from one note to another. Could someone please mention how? I did this from a note in the main window to a note in its own window. Highlight the text you want in the "from" note, then drag and drop into the "to" note. Standard kind of Windows drag and drop. I have had a few instances wherein the last screen location for opening a note in its own window is forgotten. Does not happen all the time. Will pay more attention next time to see what the steps/previous events were. Hi @CalS, maybe this is another of those issues which just happen to me. I can highlight a section of text, but I get no "handles" to move to another note. I'm a Win 7/64 user. ? Win10. Not real handles in my case, just position over the highlighted text, left click and drag. Though I just found something that I though I had seen. The DnD works fine. But if I don't modify the title of the note the drop is lost when I open the target note. IAC, just doing a DnD doesn't seem to work for me unless something else is done to the note, new or existing. Bug report, though I should put this in its own response. I just found something that I though I had seen. The DnD works fine. But if I don't modify the title of the note the drop is lost when I open the target note. IAC, just doing a DnD doesn't seem to work for me unless something else is done to the note, new or existing. @CalS, are you copying the entire note, or a portion of the body of the note? (I was trying to do the latter). I can highlight a section, but NO ability to DnD. I did all lines in the note, they were all text. Quick gif showing the process (between two open EN note windows). In the gif, the second image always displays with contents, so I can't see the DnD. My problem, though, is that I can select the items (Line1, Line2, Line3) but I can't ever drag them. Not sure what’s up. A windows thing, 10 vs 7? DnD did not work prior to this release. Sorry. Just tried the new 6.15 beta 2. The copy/paste domain name issue is still not fixed. Guys can you please fix this PITA bug for good. In moving tabs around (by click and drag), it seems like Evernote is adding whatever is on the clipboard to what gets copied. This has required masses and masses of corrections! Hate the bold font on my top list view. Not sure what the thinking was when there are more important items people are waiting on with note titles like custom sort order and indenting note titles. Almost looks like unread emails you see in Outlook with that bold font. The template option is really a nice edition that I was not expecting. I assume we can share templates with other users and users can download other people's templates (as long as they choose the share of course). 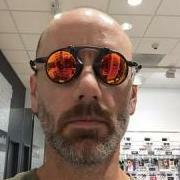 Like a template store | library? Is that correct? I use the Card View so the bold note title did not bother me, but I agree with the rest of the group, if you are using the list view it looks like bunch of unread emails. It is a nice feature to make note headlines stand out, but I think if the user has the customization option in lieu of a default bold, that would be way better. I don't know if this is specific to this new release but my Shortcut queries no longer leave the focus of the Left Panel in the place where the query is nested in Shortcuts, but move the focus to someplace in the middle of my Tag list. I don't like it. ? Weird. I click on a shortcut, the view refreshes, and if I then use the up/down keyboard arrows, the focus moves to the previous or next shortcut item in the shortcut list, as expected. How are you detecting focus change? Hmmm... note that if your shortcut references a tag name, it appears that that tag name might highlight in the tag list. Similarly for notebook names. But those items are just highlighted, they do not have focus. @jefito, I have a query called "Tips (Notes)" in the Shortcut list which highlights (in the Left Panel) the notebook: Notes and the tag: Tips. The focus in the Left Panel drops where the last line in Left Panel is the tag: Tips which happens to be one million miles away from where I want anything in the Left Panel to focus. This occurs even with Tags and Notebooks closed. Both of those are opened by the Shortcut query. This is a bug. What should occur is that my cursor (focus) should remain on the Shortcut Query which I clicked. Everything's working fine until now. Evernote Templates are working beautifully. But this font on Notes Titles is making me feel really bad. I have a query called "Tips (Notes)" in the Shortcut list which highlights (in the Left Panel) the notebook: Notes and the tag: Tips. The focus in the Left Panel drops where the last line in Left Panel is the tag: Tips which happens to be one million miles away from where I want anything in the Left Panel to focus. A note here: the term "focus"in Windows technically means the Windows element that receives keyboard input. If, for example, once you've selected the shortcut, pressing the up or down arrow keys moves the highlight that's on the tag or notebook, then yes, those elements would have keyboard focus. What I saw, when I tried it, was that the highlight (and hence the keyboard focus) stayed in the shortcut area.I still don't know whether this is what you saw -- if . Understand that focus is different than visibility -- an item that's scrolled out of view can still have focus. It feels to me that this is an attempt to show items in the left panel that pertain to your shortcut. It feels more like it's intentional behavior rather than a bug; I can see the motivation, though it's not something that I would desire for myself. 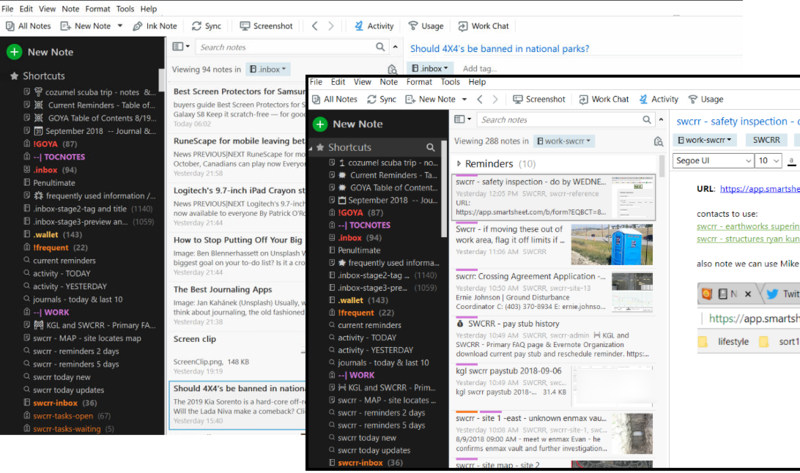 It may be experimental at this point -- note that I don't see my Notebook or Tag lists open up when I tried it;, though I did see a notebook and tag highlighted -- maybe they're doing some A/B testing there. And it probably should be governed by an option. I'd disable this behavior if if opened up my notebook and tag lists in the left panel; I generally leave the tag list closed. @jefito, I generally navigate using only my Shortcut list, so I also have notebooks and tags closed. Evernote 6.15.2.7805 (307805) Prerelease (CE Build ce-53.2.6543) is opening them when I select a Shortcut Query. I have no ability to cursor up or down the Shortcut list, because my cursor has been moved to the lowest (in the alphabet) tag. I think it's a bug. ? OK, so one curious thing: when running with shortcuts in the toolbar, I do see keyboard focus shifting from the toolbar shortcut to the left panel. I still don't see either the notebook or tag lists open up, though. And it sounds like you're using shortcuts from the left panel anyways. So in any case, are you saying that -- given that you're at the bottom of your tag list -- the up arrow doesn't do anything? Because if it actually had focus, it should. Try this experiment: do your shortcut, and then physically click on the highlighted tag, and an up arrow should move up the list. First, yes, I have Shortcuts in the Left Panel. In the case of Shortcut "Tips: (Notes)", when I click on the Shortcut, the display on the Left Panel zooms through data resting, on the last row on my screen (window) to tag:Tips. If I cursor-up once, I end up on notebook:Notes. In the case of Shortcut "Travel: Motorcycle", when I click on the Shortcut, the display on the Left Panel zooms through data resting, on the last row on my screen (window) to tag:Travel. If I cursor-up once, I end up on tag:Motorcycle. I.e. the cursor is moving through the query components in order. I still don't like it. ? Well, since I'm not seeing what you're seeing (which is interesting as well), I'll leave you to it. What you're describing isn't behavior that I'd want to see either, particularly if I used shortcuts more often than I do. Seems like there should be enough for them to go on, though. 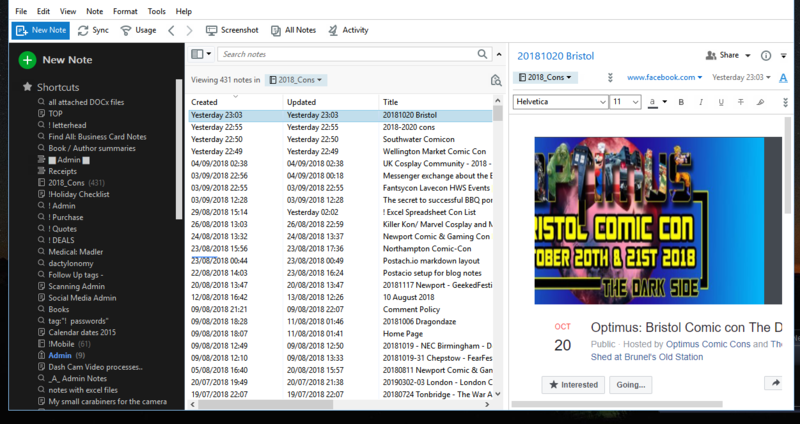 Drag and Drop a nested tag in Left panel from one folder to another is creating a duplicate tag in the destination folder. EN would not allow me to delete Duplicated tags. And because I DnD a lot of folders, I had a mess. I had to delete the parent folder and all nested tags. That meant deleting both duplicated tags and "unaffected" tags that already resided in the destination folder in order to delete the un-deletable tabs. What followed was a painstaking manual re-tagging of many notes. Manual restore is excruciatingly slow and uncertain. I'm hoping I didn't miss anything important. Not my experience - d-n-d tags move neatly from one parent to the next. I tried 1st level and 2nd level tags - were yours nested deeper than that? I've been having trouble with Drag and Drop nested tags for some time (before this release). Occasionally whole nested tag trees get moved to some other location. Considering how many tags I have and how nested they are, repair is very, very tedious. I'm not, however, having trouble with duplicating tags. Haven't been on this release very long though. I have an import folder for Notes (Windows 7 Desktop). As it happened, I had Evernote open and was using a query. The imported notes were all given the tag of what was in my current query. This is a mistake, my current query has nothing to do with imported notes. This is a bug. ? Actually it is an option. I forget which panel and. I’m not at my PC. Scan the options panels and you should see it, something about adding tags. I use this as it helps to auto add the tags when the current search context has the tags you want. For example, adding tags to an imported statement. What are your settings? Take a look and be sure assign selected tags to new notes is NOT checked. Thanks for testing it out. In my case, only two levels deep in the tag hierarchy, parent (top) level and child (nested). I had one parent Tag folder that had too many child tags and decided to divide up the tags by dragging several into another parent folder. I didn't notice when the duplication occurred, but next day, I discovered it when I created a new note. I could not tag with one of the tags I had moved over to the other folder. My tagging practice is to mouse-over to the "Add tag..." above the format bar and started typing a tag name. I forgot which tag specifically, maybe it was "Restaurant." As I typed the tag name into the new and un-tagged note, EN generated the usual pick list. As I typed "Restaurant," EN did not add the tag name to my pick list. This was odd behavior, so I went to the tag folder in the left panel to see if maybe I misspelled the tag at which time I discovered that all the tags I had DnD over from the other folder were now duplicated, e.g. two separate tags existed with identical names listed under the same parent. When I opened a note in either duplicated tag, the EN note only showed ONE tag in the tag bar. When I disassociated the tag from a note, it simultaneously disassociated the duplicate tag, i.e. the note would no longer appear in the tag's associated Top List. However, EN would not allow me to delete the duplicated tag at the child level using a right click delete from within the left panel. I was only able to delete by deleting the parent tag which consequently deleted all the child tags. I don't even know if this is version related to 6.15 Beta 2, but I tag often and I manage my tags frequently, and I haven't ever run across this problem until last night. I have fixed my problem manually, but I'm putting this here in case others are observing similar behavior. Sigh.... Agreed. Put them back the way they were. If you want to play with formatting, how about fixing the already reported issue when the left panel theme is in Light Mode when you hover over it the hover color is the same as the note count, so it gets hidden? Am I drunk or did the titles in my view get BOLD? I'm pretty sure they didn't look like that before. Even if you are drunk, when you sober up, the titles will still be BOLD then. ... and the new PDF viewer was in a beta once ... ? With this beta sometime the content I just cut-copied between notes isn't saved, I have to check before sync or some content can be lost due to this bug. Seems random. Yeah, I've seen this too. Can't repro at this point. Titles that are too long are not wrapped (i.e. continue on another line), but instead show with ... at the end. has this always been the case in recent versions? I think I remember that in the past the longer title wrapped. It behaves the way Shortcuts used to behave and I prefer it: leave the Left Panel cursor/focus on the Shortcut. Having to go back to the Shortcut EVERY DARN TIME is way, way too much overhead. What would be MUCH SMARTER: give user a function key to walk through the items in the search, or to view the entire search. It behaves the way Shortcuts used to behave and I prefer it: leave the Left Panel cursor/focus on the Shortcut. Having to go back to the Shortcut EVERY DARN TIME is way, way too much overhead. 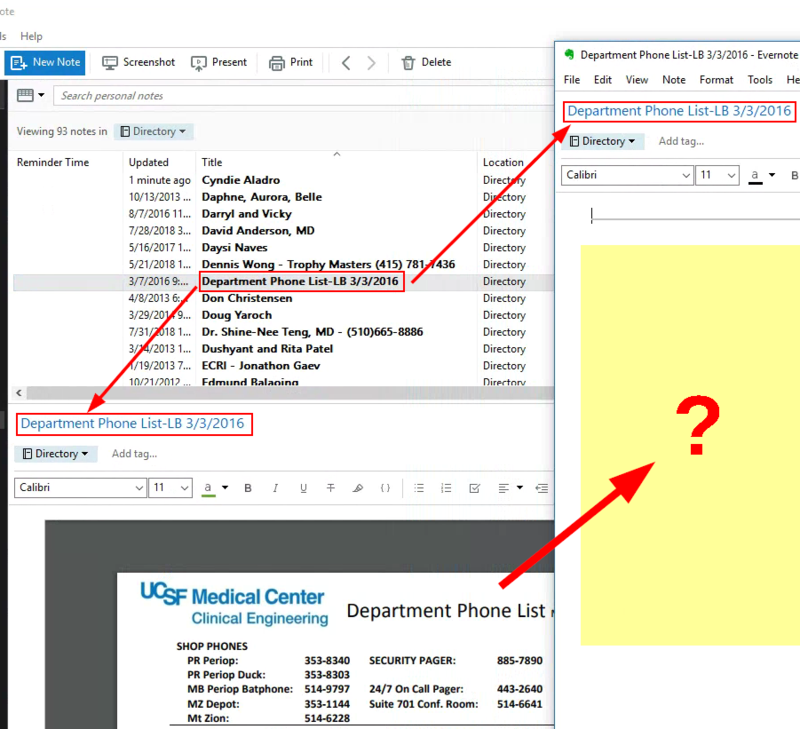 If I understand it correctly, then I believe that this behavior can be controlled by checking/unchecking "Scroll left panel into view when the item is selected" in Tools/Options/Navigation/Navigation options. But I could be mistaken. @keisoko, voilà! Thanks a bazillion. Anyone having a problem opening notes in their own window and the PDF doesn't show up? I have a lot of notes that are just a PDF file - documents I've scanned in or PDF pay stubs that I shared with Evernote on my phone. I use List View and the PDFs are not shown as attachments (View as Attachment is unchecked.) In List view, I can see the contents of the PDF just fine in the bottom window, but when I open it the note as its own window, I just get the below image. If I right-click on the PDF when in List View, then View as Attachment, then open the note in a new window, the attachment is there. Uncheck view as Attachment, then close and reopen the note, and back to the gray bar. It opens just fine on my phone too. Clearly the PDF is there, it just isn't rendering. This happens with any PDF that is supposed to be inline. I just opened a 4 year old note that was a merge of about 5 documents. The headers are all there, but where there are supposed to be inline PDFs, just gray lines. EDIT: I see others are seeing this too as I read back in the thread. @Nick Nassiri - is anyone from Evernote following this thread and working on these bugs? Or will this be published again as a regular release and then scramble to fix later when the masses start complaining, much like the sync bug a few builds ago that was reported in beta and got published anyway because no one from Evernote was actually following the thread on bug reports? @EdH, pdf loads very, very slowly for me (but it does eventually load). One interesting thing I've noticed is that Print Preview creates a pdf. Which I like very much. ? Thanks for this report. Fix is scheduled for the 6.15 GA. Note titles in Top/Side list view will not be bold in the 6.15 GA. Thanks for the feedback. Either it isn't here, or it is taking a looooong time. I've had a window open 5min and still nothing but a gray line. But I see that some Evernote coders have this on their list to fix before the GA. Thanks for the report. I've sent you an email to look into this further. And snippet view? I don't mind a little emphasis, but the current bolding is too much. Is the font size larger as well? And there's a bit of empty space between the title and the rest of the snippet that seem a little large as well. Just tried it and see exactly the same behavior. Don't know if anyone else is seeing it, but what's with the broken line below the toolbar. Line is solid and looks okay from the right of the screen clip to the edge of the window. Did a file exit and all is back to normal. I've had it come and go for the past few versions.. pretty sure it was reported at least once before too and determined to actually be note content or note metadata of some sort. IIRC, Evernote even responded to indicate they "can't" fix it - something to do with scaling perhaps. You'll see it again no doubt! Thanks. Well, same monitors for the last 4 years so not sure what new scaling has entered my universe. Maybe because I switched to Snippet few for a second or so? Hopefully related to the new bold titles and it will go away when they go away. Fortunately not that bothersome and easy enough to fix I suppose.